Golf simulators prepare golfers to learn how to hit a golf ball and can prepare them for the pressure of the 18th hole. This article shows you just how magical the 18th hole can be. Keegan Bradley lost and won the BMW Championship the two times he played the 18th hole in the final round and the playoff. Justin Rose lost and lost the BMW Championship on the same 18th hole. In your life as a golfer, if you have played competitively, you know magic happens very often on the 18th hole. It happened on the 18th hole at Aronimink. Bradley had not won a tournament in six years. He had gone from being a Ryder Cup member several years back (being arguably one of the best golfers in the world) to being ranked 120th in the world in 2018. He missed the cut at the US Open in 2018 at Shinnecock Hills. Justin Rose, a perennial superstar in golf over the past decade, needed to win the BMW Championship or come in second alone to become the number one golfer in the world, his boyhood dream. On number 18, on Monday at Aronimink, (played on Monday due to rain delaying the final round), both Bradley and Rose achieved their boyhood dreams on the same hole on the same day at the same time. That is magic. So, what really happened on the 18th hole at the BMW Championship? Bradley stood on the 18th tee with the lead at 21 under par (Rose would soon birdie 16 and 17 to go one ahead). Bradley must have thought he was just one good tee shot and one good second shot from his first PGA Tour win in six years. The 18th hole is tough – bunker right at 292, uphill almost 500 yards, par four, and it was a cool, wet day when the ball was not traveling very far. What did Bradley do on the 18th hole in regulation? Driver. Huge hook left for his tee shot. Sprayed his second shot way right. Made bogey. Not what you would expect from a golfer who hit almost every fairway and every green all week. And, Rose who bogeyed the 18th hole during regulation, what did he do on the 18th in the playoff? Magic on the 18th hole is the result of both luck and skill as everything is often on the line in a golf match or golf tournament on the 18th hole. The 18th hole is often for golfers (who wager a little or a lot of money when they play) the most important hole, worth as much as all of the other holes combined, in terms of winning or losing money. Every competitive golfer knows that “magic” happens on the 18th hole. The magic of the 18th hole at the BMW Championship does not end with Rose in the playoff doing exactly what Bradley did on the 18th hole in regulation. Bradley made his own magic in the playoff to win on 18 to win the BMW Championship. What did Bradley do in the playoff on the 18th hole? Hit a great putt to leave himself a tap in for par and victory. Think about it. 190 yards, uphill, cool, wet day, playing very long to a back right pin. What does Keegan Bradley do? He goes for the pin, hits the shot brilliantly, and wins. Magic? Some would say, just great golf. I would say, Rose and Bradley played 18 at Aronimink twice in one day, and each time for each player there was magic, some good and some bad. Rose lips out on the 18th in regulation and missed a four and one-half foot putt on the 18th in the playoff, his first miss under five feet in 48 attempts at the BMW. Something is magical about the 18th hole in golf when so much is on the line, and that magic can work both ways, good and bad. We all know it and have experienced it. 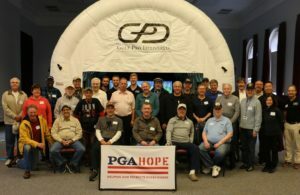 Herb Rubenstein passed the PGA Players Ability Test in August, 2018 at age 65, making a twenty-foot par putt on the 18th hole when he played his first round of the PAT, and then made a fifty-foot birdie putt from the fringe on the 18th hole the second time he played the 18th to shoot 80 -78 – 158, exactly the qualifying number. 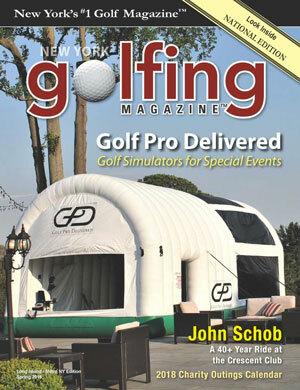 He is a golf pro with Golf Pro Delivered, www.golfgpd.com, and can be reached at [email protected] or 303.910.7961. He was captain of the Washington and Lee Golf Team in 1974 and serves as Executive Director of the Brooklyn Golf Alliance, www.brooklyngolfalliance.org, a nonprofit that works to bring the joy of the game of golf to inner city minority groups and women who have been under-represented in the game of golf from its inception.